Susan Berry is from Central Pennsylvania where she studied art at every opportunity. She graduated with a B.S. in Art Education from the Indiana University of PA. She has a diverse array of artistic interests, all centered around an emphasis on color, texture, and involvement of organic shapes and subjects. Susan also holds a Fellowship with The Gemmological Association of Great Britain (London, UK) as well as certification in Diamonds and Jewelry Design from the GIA. 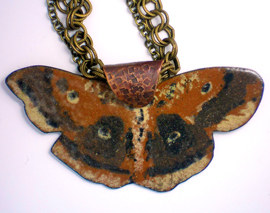 Susan’s work includes copper enameling, silversmithing, lampwork glass, and water media painting. Surrounded by the glory of nature, her home studio on the mountain in Bernardsville provides an ideal point for inspiration. Susan enjoys traveling extensively around the globe to explore gem mining areas and to find both natural inspirations as well as gemstones for her ever evolving artwork.